Flourless anything is awesome, right? 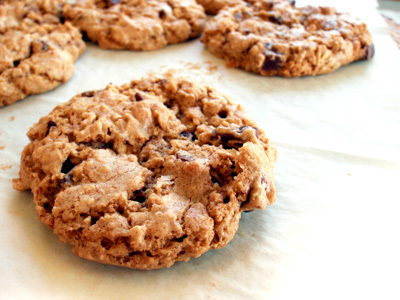 And there are many good flourless pb cookie recipes out there. I was inspired by this blog post comparing 2 great recipes - so I based this recipe loosely on the winning cookie. If you know me, you'll know that I make things as tasty and healthy as possible (I walk the line) so these are just about as healthy as non-healthy tasting cookies can be. While developing this recipe, I did have one challenge… no good peanut butter. In this part of Mexico, you can only find the stuff with hydrogenated oil. So I made my cookies with whole roasted Spanish peanuts (with the red skins) ground in a coffee grinder till they just started to clump. A few big chunks gives a nice texture anyways - and it's the freshest healthiest "peanut butter" you can get. There's also the bonus of antioxidants from those red skins. Anyways, I made these cookies many times until I got the ratios just right - I hope you love these as much as I do - enjoy!